All wonderful, drought ending rain we have received in California this season has filled our lakes and reservoirs, and greatly improved the ground water levels throughout the State. It’s been wonderful. Of course there is always a reaction to any set of events. In this case, all of the rain has created what is sure to be a record year for grass, brush, and tree growth. And by the time the hot days of July and August roll around, much of this growth will be brown and dry, setting the stage for a record wildfire season in the State as well. While, we here in the West Orange County area have very little open space for grass and wildfires to take hold and threaten lives of our properties, many of us own or travel to other properties that could be threatened. Cal Fire has created a terrific resource at ReadyForWildfire.org, which outlines their 3-Step process for surviving California Wildfires. This short video summarizes the process. The most important part of the Cal Fire program for us here in West Orange County is the preparation checklist. This checklist is important not only for wildfire, it is important to your survival in any disaster. Grab your copy of the Wildfire is Coming Brochure and make sure you are ready for fire or any other disaster that may come your, or your family’s way. It just takes a few minutes to become aware and could save your life and the lives of those you love. 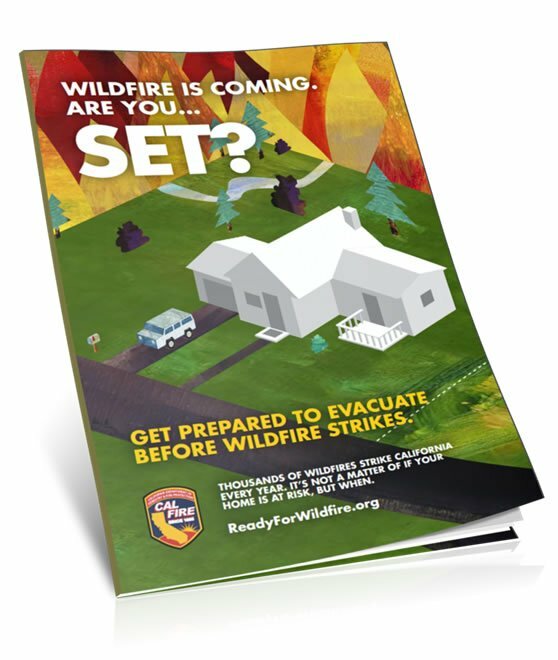 The CalFire Get Set Brochure outlines what you need to know.